Volatile Corrosion Inhibitors (VCI) are necessary to protect your metal parts from corrosion and rust during storage and shipping. At Aactus, we offer specially coated paper, film, and bags to ensure your metal products are protected from the elements that may not be a concern for plastic or other materials. VCI bags from Aactus can be used with painted or unpainted metal parts regardless of their shape and size. The bags work by emitting a corrosion inhibitor which protects the metal in both the short and long term. Our quality VCI bags provide a durable, tear-resistant exterior, while also providing a non-toxic, odorless VCI moisture barrier interior. 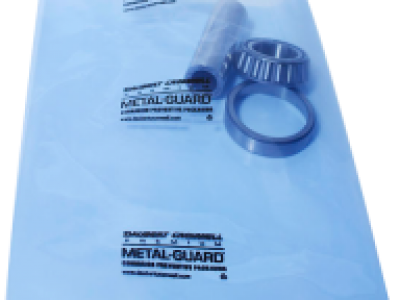 Our heat-sealable VCI bags meet various military and automotive requirements and can oftentimes be customized to your specifications. When using VCI materials it’s important to use the proper type for the metal you are protecting. For iron, cast iron, and steel, you should use yellow VCI Ferrous Packing; for full galvanized steel, aluminum, bronze, brass, and copper, be sure to use clear or blue non-ferrous packaging materials; for materials that use a combination of ferrous and non-ferrous metals you should use VCI green or clear VCI multi-metal packaging; and for silver, use clear VCI silver packaging which will protect silver from tarnishing. Now, with all of that being said, these are the industry standards. If you would like a custom color for your metal product’s packaging. At Aactus, we are Livonia’s premier packaging materials distributor with a wide range of quality packaging products, including VCI Metal Protection bags. If you are in need of a supplier you can trust to provide your company with high quality packaging products at a fair price, do not hesitate to contact us today!